You don’t need to be a pro on blues amplifiers or even amplifiers in general to know the prestige held by the name AC30. This legendary amp has been seen on the world’s most famous stages, used by every icon from The Beatles and The Rolling Stones to Queen, Radiohead and Rory Gallagher. The AC30C2 is one of the newest iterations of this all-tube VOX legend, and described by the British brand as ‘the most versatile AC30 design in VOX history’. Let’s see how it stacks up! The AC30C2’s controls are by no means as extensive as some other amps in the sub-$1,000 price range, but what it offers works well. From left to right, you’ll first find the simple volume control for the ‘normal’ channel, before a volume, treble and bass controls for the ‘top boost’. Alongside these are individual controls for both the reverb and tremolo, in addition to the final master volume and tone cut knobs. A very simple system, but one that is easy to get to grips with. There are no surprises in the design department as the AC30C2 retains the classic AC30 styling, from the retro brown diamond grille cloth to the burgundy top panel, housing those vintage-style ‘chicken-head’ knobs. While the design may be very similar to the original, there are several modern upgrades that make the AC30C2 a mouthwatering prospect. In particular, the hardware is impressive – under the hood of this combo amp you’ll find three 12AX7 preamp tubes and four EL84 power tubes, which offer a generous 30 watts of power to the two 12” Celestion G12M Greenback Speakers. The top panel reveals that the AC30C2 is a two-channel amp, featuring two input jacks each for both normal and top boost channels, while it also offers both very solid reverb and tremolo options built in. In terms of performance, the AC30C2 excels at replicating that classic Brit invasion tone of the 1960s – if that’s what you are looking for, this is the amp that unequivocally delivers it. The cleans are sparkly, smooth and clear, while it’s simple to dial in a sweet vintage blues tone, with an easy to achieve natural overdrive that really sings. Featuring that classic VOX rasp, this amp is also at home with classic rock. The channels on this amp offer you incredible versatility, with the normal channel providing a rich and fat tone, while the top boost channel offers an edgier, more aggressive sound. Even at 30 watts, it’s a loud amp and extremely responsive to your playing dynamics. The effects are equally as commendable, with a wide-ranging reverb and impressively atmospheric tremolo. In years to come, the AC30C2 will probably have been replaced by another AC30 iteration – VOX keeps coming up with new ways to pay tribute to the original legend. For now, the AC30C2 is the closest you’ll come to owning that original Brit invasion sound, yet it’s just as solid a blues amp as anything else, with tons of bite and soul. For the midrange price, the AC30C2 proves great value. 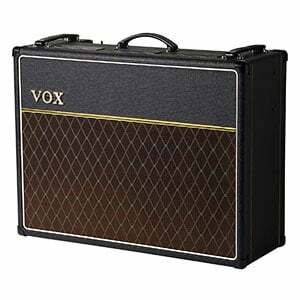 For more info about the VOX AC30C2, click here.